Marie Muccie was born in Trenton, New Jersey on May 1 , 1921 of Italian parents. She had 11 siblings and her parents believed that daughters were for marrying. However, as Marie approached adulthood, she developed other ideas. Ideas she had to keep secret. Like all the women in the program, Marie received a telegram from Jackie Cochran for an interview. She went to Rockefeller Center to meet Jackie and present her flight log. Once Jackie saw Marie's 300 hours she said, "We can use you." That was easy, now came the hard part. It wasn't that she was 2 inches too short, it was that she was still a minor by about 6 months. She would need her parents consent to join. Marie told Jackie that she would get it. Jackie wanted to know how quickly she could get to Houston to start training. Marie said she had to get money for the trip first. Jackie needed her now and loaned her $75.00 for train fare. Marie returned home. Now all she needed was her dad's consent. But, as she expected, he said no. She replied that she would have to join the Air Transport Auxiliary (ATA) which was providing combat support for the British and they didn't need his permission. Fearing a sure loss of his daughter if she joined the ATA, Mr. Muccie decided to pick the lesser of the evils and signed the consent. What Marie did not mention to her dad was that she had already been rejected by the ATA for being too short. Off she went to Houston, Texas, and at least 16 weeks of flight, navigation, simulator, and ground school training. She started training in mid December, 1942. The 16 weeks were stretched by about 7 more due to the fog in Houston that kept the planes grounded more that originally planned. After the graduation ceremony on May 28, 1943, for class 43-2, Marie walked over to Jackie and gave her back the $75.00 she was loaned back in December. From Houston, Marie was assigned to New Castle Army Air Base in Wilmington, Delaware, as part of the 2nd Ferry Group. From here, she went to Love Field in Dallas, Texas, with the 5th FG. 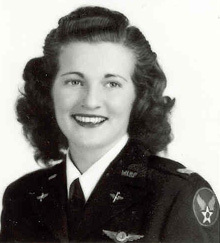 Her final duty station was at Fairfax Field in Kansas City, with the 33rd FG. During her time in the WASPs, Marie flew the L4-H, PT-19, BT-13, AT-17, AT-10, AT-6, C-73, UC-78 and, last but not least, the B-25. While stationed in Kansas, Marie met and married Captain Michael Genaro. It was a military style wedding and two other WASPs, Magda Tacke of 43-1, and Helen Porter of 43-5, were her brides maids. Marie and Michael met in a B-25 during a delivery from Kansas to Wichita Falls, Texas. Marie retired from the WASP in August, 1944. Michael and Marie started a family in Dallas and raised three girls and a boy, Laura, Cynthia, Sue and Michael. Over the years Marie lived in many places including Colorado, Switzerland, and Florida, where she started a nutrition business that she later sold. "Opponents of the bill say we WASPs were not under military discipline. They must be kidding. We received the same training as the male Air Force Cadets. The U. S. Army Air Corps issued orders for all military missions. We flew all the same type military aircraft from small trainers to bombers. Wouldn't you say we risked our lives in the type of duty to help release male pilots for combat during the pilot shortage. Thirty-eight women were killed flying these missions. "It's true some WASPs may not have need for these benefits, but others do. By offering official recognition of our part to help win the war would mean a great deal to us. It would be like the U. S. government saying, 'Thank you for a job well done.' We earned it, we deserve it and we did do a good job." When Marie started her health store in Florida she was a nutritional consultant and believed in and practiced a healthy life style. She tried to exercise five days a week with water aerobics, light weight lifting, biking, and treadmill at a local health club. Marie is survived by her four children and two grandchildren, Mario and Adria. Most of the information presented here was found in a biography in the B. S. Turner book, "Out of the Blue and Into History". Additional information was taken from "On Silver Wings" by Marianne Verges and from my own research on WASP training. All but one of the pictures are from the family and were provided for this effort by Cindy Weigand, a family friend and author of It's My War, Too: Texas Women in WWII, due out in winter, 2003, and includes a chapter on Marie.